There are quite a few "Where I Read" threads in the Other Media forum, so I thought I should try my hands at this myself. 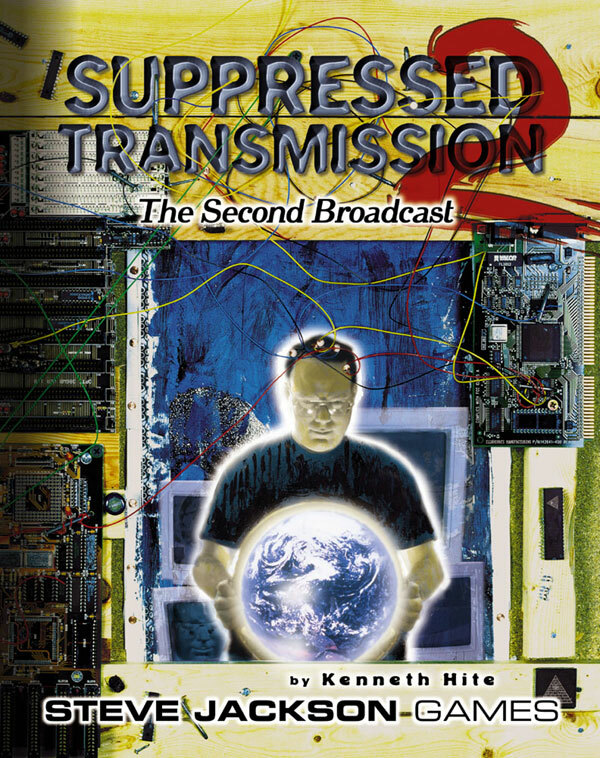 However, instead of writing about novels or comics I'm reading, I plan to write about a gaming column - to be precise, Kenneth Hite's "Suppressed Transmissions". "Browsing one afternoon in a conspiracy bookshop, young Kenneth Hite found himself at the epicenter of a mammoth earthquake and was buried by books. When rescuers dug him out of the rubble a week later, he emerged as - The Freaking Lunatic!" So when back in 1998 Pyramid, the gaming magazine published by Steve Jackson Games, moved from print to a HTML-based, online subscription magazine, Scott Haring, the editor of the magazine at the time, offered Ken Hite the opportunity to write a weekly gaming column about anything he wanted, as long as it wasn't reviews or industry news (as Kenneth Hite already did a column for those elsewhere). He accepted. The result was the "Suppressed Transmission" column, where he basically wrote about any topic that caught his interest, which mainly involved conspiracy, horror, secret history, and alternate history, . While they frequently referenced GURPS books (which by their nature tend to be reference books themselves), they were ultimately system-free and usable with any game system. And thus, this column quickly evolved into the main reason for subscribing to Pyramid by many, many gamers, as it had more gamable ideas per paragraph than almost any other texts out there. These compilations not only featured the original columns, but also had copious footnotes by the author which explained some aspects in more detail, as well as providing suggestions for further reading - thus, they were well worth the price even for those who already had the online versions. Additionally (and rather unusually for Steve Jackson Games, especially in those years) they added lots of illustrations from a large number of sources which actually was very pretty! But unfortunately, those compilations never sold well (in fact, they never sold out their entire print runs, as you can see here and here). Years passed. Kenneth Hite became preoccupied with other projects, and his once weekly columns became a trickle, causing many readers to let their subscriptions lapse. Thus, there was great wailing and gnashing of teeth when Steve Jackson Games announced that the magazine would shift from HTML to PDF publication, and that current subscribers would be able to download the entire archives for a limited time. Lapsed subscribers were out of luck. Steve Jackson Games also said that they were considering republishing the old articles in PDF at some future point, but so far this hasn't happened (though maybe they will get started on it once they have converted all their old issues of Space Gamer...). 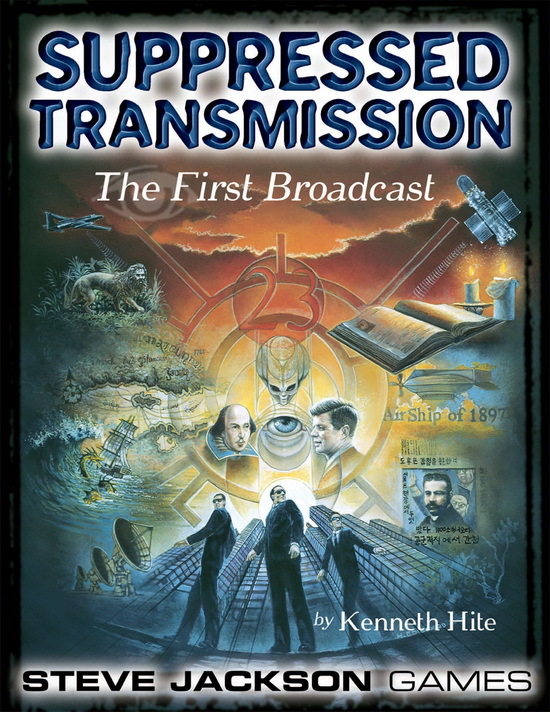 Fortunately for me, I was still a subscriber - and as it happened, a few weeks before the shift I had already downloaded all 300 existing Suppressed Transmissions articles and hacked them together into one vast, hyperlinked ebook file for my Kindle. Which was awesome, by the way. More time passed. I dedicated the Arcana Wiki to the memory and principles of the Suppressed Transmissions. Gamers kept on lamenting that they missed out on the columns. Hearing their pleas, Steve Jackson Games published ebook versions of their first two collections. However, sales remained low - I discovered today that the PDF of the first collection only sold 66 times, and the PDF of the second only 56 times. With sales numbers like this, republishing the rest of the Suppressed Transmissions will remain a very low priority for Steve Jackson Games - as admitted here. After all, they make their business decisions by looking at the numbers, which is why they are still around after 30 years in the business with the same guy in charge and other gaming companies aren't. 1. I want to show people what they have been missing out by not having subscribed to the old Pyramid. Yes, I thrive on hate and envy. 2. I want to boost sales numbers of the existing collections, especially the ebook versions. If they manage to sell a couple of hundreds of PDFs each, I figure that publishing collections of the later columns will become a higher priority for Steve Jackson Games. And if they sell particularly well, maybe they will even hire Kenneth Hite to add footnotes, in which case I get new material as well. And in the end, isn't this all that matters? "I put great store in the H.P. Lovecraft dictum that the 'piecing together of dissociated knowledge' opens up 'terrifying vistas of reality,' at least in roleplaying games..."
The very first column, beyond explaining the origin of the term "Suppressed Transmission" (from the 1991 movie "Slacker"), gives us an idea what to expect from future transmissions by giving us some short examples from each of the main themes - Conspiracy, Secret History, Horror, and Alternate History. Kenneth Hite starts out with an interesting rumor he read in one of his many, many books which claims that Abraham Lincoln was such a capable politician that he just couldn't have possibly have an utterly unremarkable origin - no, he had to be the son of someone famous. Thus, muses Hite, might he have been the result of some conspiracy trying to create particularly "potent" bloodlines, like the Prieuré de Sion? Then he speculates on the other famous people born in the same year, 1809 - Edgar Allan Poe, Charles Darwin, and the poet Alfred, Lord Tennyson. He further hints at another noteworthy event that year, the Man Who Walked Around The Horses, which is expanded upon in one of the footnotes (where he also contemplates writing a future column on (sadly, he didn't). The rest of the column then follows the year 1809 and see what else might be happen. In Secret History he speculates upon the death of Meriwether Lewis. In the Horror section he muses on a world based on the visions of Edgar Allan Poe. In Alternate History, he points out that both Wellington and Napoleon were involved in heavy fighting on opposite ends of Europe which might have gotten them killed - and that the death of either might have helped the survival of the French Empire. Finally, Kenneht Hite gives us a short introduction of himself and his previous works. "According to boring old historical fact, he served as Lord Chancellor of England, betrayed his benefactor Essex to a charge of treason, pled guilty himself to bribery and corruption, wrote books of essays and histories, codified the scientific method in Novum Organum and The New Atlantis, and died on Easter Sunday after catching pneumonia trying to freeze a chicken..."
This transmission is not as much about Francis Bacon himself - though as Kenneth Hite explains in sufficient detail, the man certainly had enough going for him to use him in a game - but rather, how everything is connected to him, or how everything is connected to everything else in general. And where people, events, or things aren't apparently connected, it is quite likely that you are able to connect them with each other with a little research, using one to three intermediaries. From this you can span a vast web of conspiracy, and thus get your players into the proper paranoid mood for conspiracy gaming. This column isn't really a ready-made adventure or campaign framework as such, nor does it examine a particular topic in detail. Rather, it represents a useful thought exercise, something that helps a game master get into the proper frame of mind when working out their own conspiracies - the lessen that everything can be connected if you squint hard enough is a useful one, and one that I have striven to embed into the Arcana Wiki. You should alternate between counting up from the first and back from the last, to drum up interest for those which can and cannot be purchased. I had thought of doing something similar myself, but I'm glad to see you beat me to the punch -- I think you'll do a much better job than I could. Nah. For one thing, I prefer it to be one coherent narrative from start to finish. From another, it makes sense to make those which can be purchased first - since sales of these will determine whether future collections will be made. Seeing Suppressed Transmission being talked about made me go and look at my Pyramid archive, too. I found it odd that the earliest one I could find in there was the one from 3rd Feb 2000 - "The Suppressed Transmission Tarot IV: The Suit of Cups". I have the print collections. I wonder if all the ones prior to that date are collected in the print editions and that's why they don't seem to be in my archive. That's rather irritating. I'll have to dig them out from the bookshelf and check what's in there and what the publication dates were. I admit I may have missed some. Or maybe they were... suppressed.